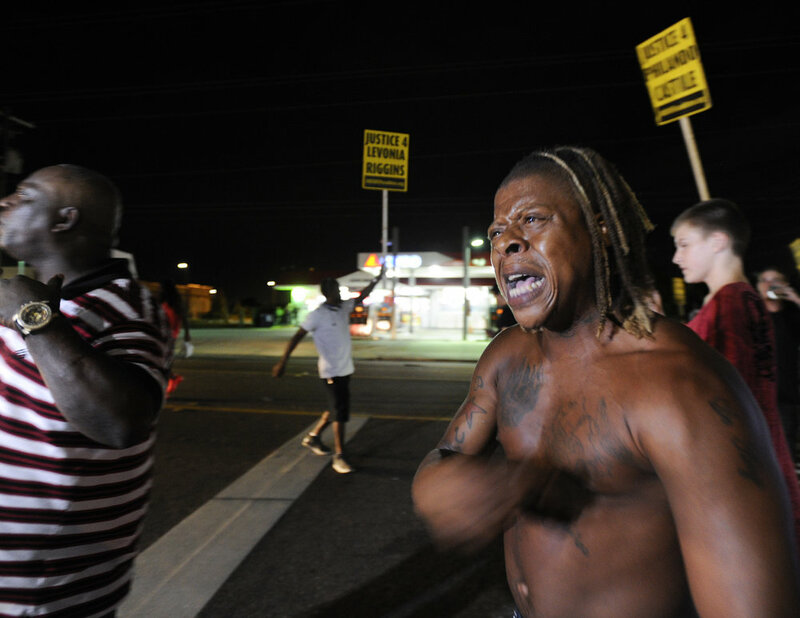 Darrell Judkins, a 29-year-old from Tampa, yells to the crowd during a gathering outside the Get N Go convenience store on South 78th Street on Sept. 2, 2016, to protest the death of Levonia Riggins, a 22-year-old who was shot by a Hillsborough County Sheriff SWAT deputy on Tuesday. "It was important for me to make a statement with my people," he said. Michael Morales, 35, shows a tattoo he got in honor of Martin Benitez, his boyfriend who died in the Pulse massacre: "If God takes me sight it's because he's allowed me to see all of the world's beauty." From left, Marjori Lobman, 52, Angel Rodriguez, 35, Larry Beaududoin, 69, and Beverly Minardi, 55, cheer after one news channel projected Trump to win in Florida during a presidential election watch party at The Hideaway in downtown Tampa on November 8, 2016. South Florida Fair guests are seen walking underneath the gondola and Ferris wheel rides after dark at the South Florida Fair in West Palm Beach, FL. Thousands of visitors come to the South Florida Fair to play games, eat food and see attractions during the fair's 16-day run. Members of the Florida National Guard Honor Guard welcome home the remains of World War II Second Lieutenant John Donald Mumford at Tampa International Airport on Thursday, March 16, 2017, in Tampa, Fla. On June 6, 1944, Lieutenant Mumford was shot down in his P-51 Mustang in the skies over Romania. Hillsborough County Clerk of the Circuit Court Pat Frank listens to a speaker during the memorial service for her daughter, well-known Tampa figure Stacy Frank, at the Tampa Museum of Art on July 20, 2016. In June, Stacy passed away after a six-month-long battle with lung cancer. Carmelita Eggebrecht of Longwood, Florida, helps to hold up a 100 foot-long rainbow flag on June 17, 2016, at the All Souls Catholic Church in Sanford, Florida, during the vigil of Luis Vielma, a victim of the June 12, 2016, Pulse nightclub shooting in Orlando. Eggebrecht and several other volunteers held the flag up for over five hours to provide the family some privacy from passersby on the road and to show their support in the wake of the tragedy. A trio of fisherman are seen in their boat on the Lake Osborne water at sunrise in James Prince Park in Lake Worth, Fla.
Captain Brian Helmerson of the Gainesville Police Department seperates protesters on the site of a monument on the corner of West University Avenue and North Main Street on Jul. 9, 2015, dedicated to fallen Confederate soldiers. One group called for the removal of the monument while the other called for the monument to stay. Tranice Smith, 19, of Riviera Beach, poses for a portrait in the motel she's been living in ever since her ex-boyfriend trapped her three children in her apartment and burned the home down. The three infants survived, but Smith knows what she would do to the man who fathered two of her children. "He can't swim. I would push him in a pool." Jacquelyn Jamason watches her son, Ethan, speak to reporters at the Palm Beach County Courthouse on Tuesday, September 26, 2017, in West Palm Beach, Fla. Circuit Judge Charles Burton sentenced Jamason's former partner, Kimberly Lucas, 43, to life in prison for killing the 2-year-old daughter she shared with Jamason, plus an additional 30 years for trying to poison their at-the-time 10-year-old son. John Kern, a deputy chief of field operations with the Florida Forest Service, looks at the burning remains of the campground fire near the Serenova Tract area in central Pasco in April 2017. Brookelyn Rawn of Newsome High in Lithia, Fla, practices twirling a flag during band rehearsal at sunset on Thursday, November 17, 2016. On November 24, the 150 members of the school's Wolfpack Marching Band will perform in the Macy's Day Parade, the only band from Florida to do so. Fifty-nine-year-old Lake Worth resident Mario Velasquez poses for a portrait holding a candle, his main source of light at night, inside his Orange Grove Mobile Home Park residence in Lake Worth, Fla., on Tuesday, September 12, 2017. Velasquez said the neighborhood had been without power since Friday, two days before Hurricane Irma impacted the county. "One feels bothered because nobody pays attention to us," he said. "Because we're poor we don't get as much attention." Trey Rumlin, an 18-year-old Tampa resident, stands nearby the Get N Go convenience store where Levonia Riggins worked during a gathering on South 78th Street on Sept. 2, 2016, in honor of the 22-year-old who was shot by a Hillsborough County Sheriff SWAT deputy on Tuesday. "Daddyman was like a bro to me," Rumlin said, referencing Riggins' nickname. About 150 gathered with signs around the convenience store. President Donald Trump waves to gathered supporters while descending Air Force One behind First Lady Melania Trump and their son, Barron Trump, during President Trump's arrival to Palm Beach International Airport in West Palm Beach. Tampa Police officers stand next to a car involved in a fatal motorcycle accident on East Busch Boulevard between North 16th Street and North 17th Street on Saturday, Sept. 17, 2016, in Tampa, Fla.
Palm Beach County Sheriff Office bicycle deputies are lined up at the corner of Southern Boulevard and South Flagler Drive during the March for Our Lives demonstration in West Palm Beach, Fla., on Saturday, March 24, 2018.